The dog days of summer are here, and along with them, the annual cicadas. They’re brown and green, look a bit intimidating and punctuate the hot, heavy August air with loud, raspy buzzing. Usually present beginning in mid-July, annual cicadas were sparse in our garden until the heat and humidity arrived last weekend. Now the air vibrates with their whining buzzes, and in the late evening, is accented with cricket song and the weet-weet-weet call of a male cardinal. Cicadas “sing” from the branches of our apple, ash and spruce trees. In the sultry dusk, a large cicada takes off from the apple tree buzzing loudly; a small bat pursues it across the backyard and out of sight. 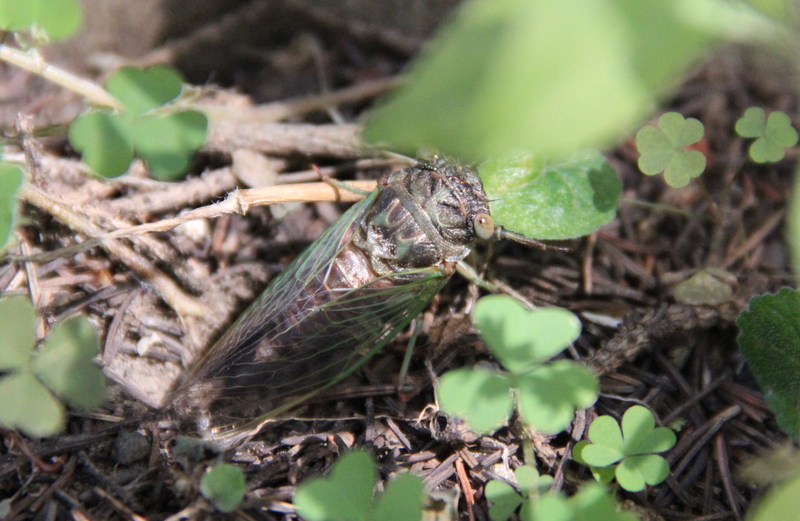 Annual cicada sitting among plants and needles beneath our spruce tree. Between one and two inches long, the adult annual cicada (Tibicen canicularis) has a blunt, thick body and large wings tinged with apple-green. Cicadas live just a few days as adults singing in the trees, mating, and laying eggs for the next generation. Females cut a slit in a tree branch and deposit their eggs. When a nymph hatches, it burrows down into the soil beneath the tree where it spends 2-to-5 years sucking juices from the tree’s roots. When it is ready, the nymph leaves the soil and climbs up the tree, splits open its exoskeleton and emerges as an adult. 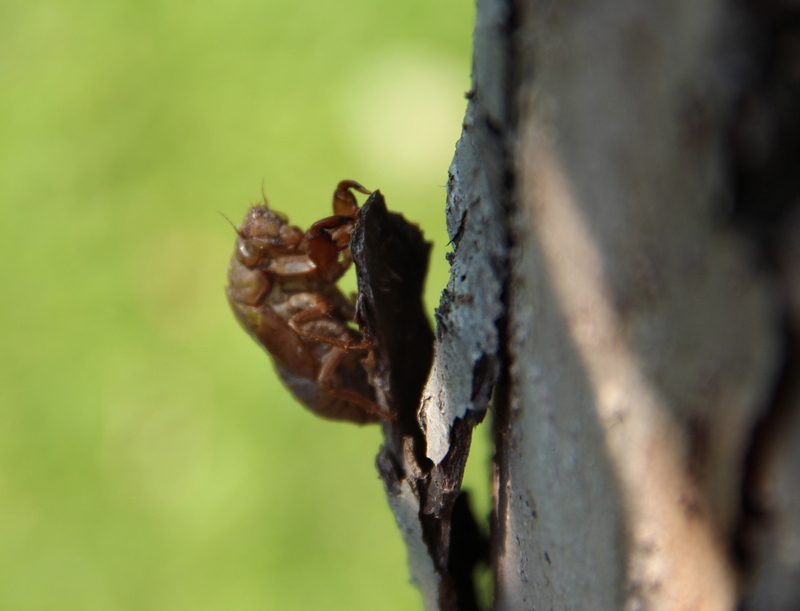 A molted exoskeleton, or hard outer casing of an annual cicada nymph, attached to the bark of our apple tree. The annual cicada is also called the dog-day cicada because it is most plentiful and vocal during the steamy days of late August. Sirius, the brightest star in the sky (excluding our sun), is the largest star in the constellation Canis Major, or Greater Dog, and so is known as the “dog star”. At this time of year, Sirius rises in the southeast just before dawn. The ancient Egyptians and Romans thought that the star added its heat to our sun’s, making late summer the hottest part of the year in the northern hemisphere, and called it “the dog days of summer”.